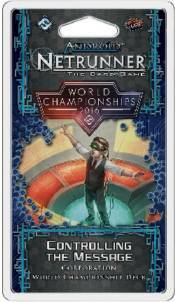 The 2016 Android: Netrunner World Champion Corp Deck is a recreation of the deck piloted by Chris Dyer to a first place finish at the 2016 Netrunner World Championship last November. The deck features extended full-bleed art for every card as well as new visuals for NBN Identity Controlling the Message. This fully-legal deck not only gives veterans a new visual format for classic cards, but allow new players to experience dominating strategies and successful deckbuilding.